At 6-foot-1, the left wing is about average height, and listed at 167 pounds, he still has weight to gain. He’s a quick decision maker with the scorer’s touch, coaches like to say, something you just can’t coach. 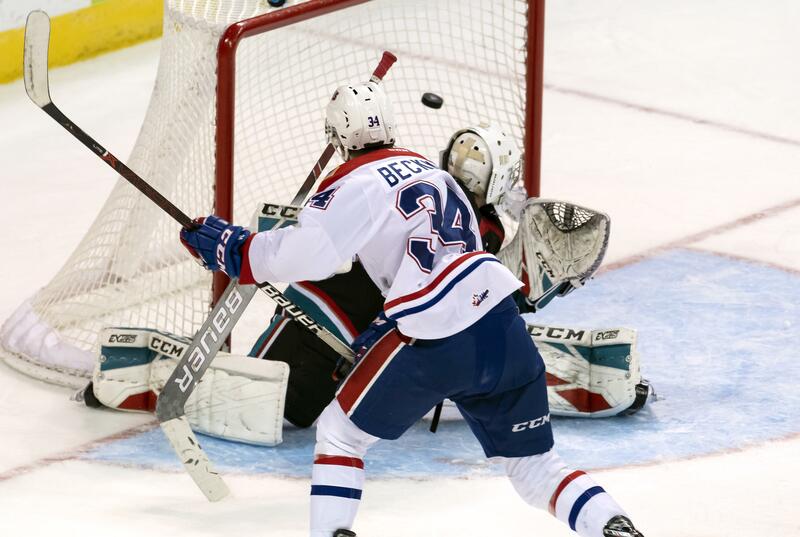 But at 14 years old, when the Spokane Chiefs used a fifth-round pick on him the 2016 Western Hockey League bantam draft, Beckman was 5-8 and 139 pounds – definitely a wait-and-see-if-he-grows kind of player. “It’s a skill that we have as scouts,” Chiefs assistant general manager Chris Moulton said of projecting players’ physical growth three or four years out. They got plenty lucky with Beckman. The Saskatoon, Saskatchewan, native finished the regular season second among WHL rookies in goals (32) and points (62). Among the top eight rookies in points this year, Beckman is one of two who wasn’t a first-round pick in the bantam draft. In their best-of-seven opening-round series against the Portland Winterhawks, which the Chiefs won in five games, Beckman finished third on the team with five points. He’ll look to increase that total when Spokane visits the Everett Silvertips to open its second-round series Saturday. That 2016 draft was particularly good for the Chiefs. Their first-round pick was Luke Toporowski, a known commodity for the franchise. Luke’s dad Kerry played for the Chiefs on their 1991 Memorial Cup team, and his brother Jake played in 100 games for the Chiefs from 2014-17. In the second round they took Carter Chorney, who played 27 games with the Chiefs this year before being traded to Swift Current. And in the ninth round they took Cordel Larson, also from Saskatchewan, who had 14 points in 58 regular-season games for the Chiefs this season. Luke Toporowski, along with Beckman, is projected to be selected somewhere around the fourth round of this spring’s NHL draft. To get four WHL players out of one draft is about what the franchise wants, Moulton said. But to get a top scorer in a middle round is a boon. After being drafted, Beckman spent two seasons with the Battlefords Stars in Saskatchewan. The Stars weren’t particularly good those two years. In 2016-17, they finished 15-27-2; in 17-18, they went 17-26-1. But each year Beckman led the team in scoring, getting minutes on the power play and playing on the top two lines, opportunities he might not have received elsewhere. Chiefs coach Dan Lambert certainly took notice. Considering the adjustments it takes not just on the ice, but off of it – transitioning into a new school and a new city, plus billeting with a host family – teammates are impressed with Beckman’s rookie campaign. For his part, Beckman said he tries not to think too much about the meetings with NHL scouts and what his career might be ahead of him, what with the Chiefs playing in the second round of the playoffs for the first time since 2013. Published: April 4, 2019, 5:25 p.m. Updated: April 4, 2019, 6:45 p.m.